On Wednesday, the House Oversight and Government Affairs Committee held a hearing (more of a grilling) as Mylan’s CEO, Heather Bresch, the daughter of Sen. Joe Manchin (D-W.V.) took to the floor to give a defense of the EpiPen’s price hikes and to receive a verbal smackdown from an assortment of legislators. Taking the moral high ground is easy, and shouting down someone for what has largely been portrayed as a villainous act is sure to resonate with many constituents. But we must dive below the surface if we intend to get at the root of the issue. The fact is that what has happened with Mylan and the price hikes is merely a symptom, not the disease. The disease, despite taking many forms, is a familiar one: Government intervention. The FDA’s harsh regulations also make it an arduous, costly, and time-consuming process to get a new drug or device on the market. In fact, bringing a new drug to market in the US can take upwards of a decade and cost billions of dollars thanks to the FDA’s regulations. This interference by a government agency does nothing to help foster a free market. Furthermore, because of Congress, the FDA can inadvertently create a monopoly, which is what happened in the case of Mylan. As far as epinephrine auto-injectors go, the scene in the US used to be a little more crowded. At one point, there was Auvi-Q, a pocket-sized device--convenient, discreet, and it even played audio instructions. Alas, this innovative device was recalled by its manufacturer due to reports that it was not administering the proper dosage. In March, pharmaceutical company Teva, which faced some dumbfounding roadblocks in the form of patents, as Sen. Rand Paul (R-Ky.) points out, had its application for a new auto-injector denied by the FDA. 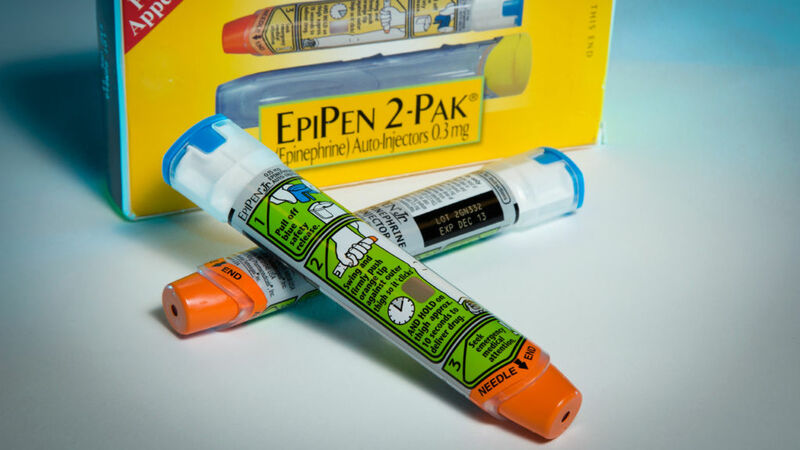 Two competitors down, and two months later, the EpiPen gets a price hike, the story is widely-publicized and attracts a great deal of outrage. During the hearing, Rep. Mick Mulvaney (R-S.C.) blasted Congress and Bresch for making it difficult to bring consumer choice in the market for epinephrine. "The same exact thing, from the same exact manufacturer, I think you can get it over-the-counter in Europe for $75. One of the reasons, by the way, is that there's nine different people making the stuff in Europe," Mulvaney said. "One of the reasons [Mylan] can charge $300 or $600 is because it's too hard to get products approved in this country. An EpiPen competitor would be even more difficult because it's both a drug and delivery device." Mulvaney explained that Mylan lobbied Congress in 2013 to pass legislation that forces Americans who need the drug to buy Mylan's EpiPen. "You've lobbied us to make the taxpayer buy your stuff. At the federal level, we passed a law here. We did it, by the way. I was here when we did it. Everybody was here when we did it," Mulvaney added. "We did it in 2013, we did it by voice vote, one of those magical things that happens when [members] aren't on the floor. The White House called it the EpiPen bill." The solution to this issue is less regulation, which will allow competitors to easily enter the market, giving people a choice and restoring their freedom to determine what is best for their life and their health. If our legislators truly care about people having affordable medication, then the next person to receive a bipartisan beatdown should not be a pharmaceutical CEO, but the head of the FDA. Attack a limb and the tree still lives. Destroy the root and the whole tree dies. Even if Mylan folds or competitors get approved, the fact is that as long as there’s no change from the FDA, this is going to happen again, and again, and again. The system has been set up in such a way that a government-protected monopoly on a life-saving medicine is permitted to exist. Once its competition had been eliminated and with the knowledge that any future competitors would have to jump through the FDA’s hoops, it should come as no surprise that the price of the EpiPen went up. This is not to act as a defense of Mylan. Indeed, the cheap price of the syringe and epinephrine vial combo (the syringe costs more than the medication) makes Mylan’s current $608 price tag a bit nauseating. And yet, what is truly sickening is that the government seems to be operating under the belief that it has any business telling people what their choices are regarding health care. Though if one did have to give a defense of Mylan’s CEO, it would consist of a single sentence: Don’t hate the player, hate the game.